Absolute pressure (AP) transmitter measure relative to perfect (full) vacuum pressure (absolute zero pressure); therefore, AP transmitters are not affected by fluctuations in the local atmospheric pressure. All absolute pressure measurements are positive. The letter ‘a’ or the abbreviation ‘abs’ in the unit of measure (i.e., inH₂O(abs) or psia) indicates an absolute pressure measurement. Example Industrial Applications: Any critical storage and delivery application (i.e., toxic gases) Because atmospheric conditions can fluctuate, it is imperative that these systems be accurate and use a reference that is static. Yokogawa absolute pressure transmitters use digital DPharp sensor technology to get accurate, reliable readings to you quickly. Click the 'Details' Tab above to learn which series is right for your application. Traditional-mount Absolute Pressure Transmitter based on the EJA-E Series. 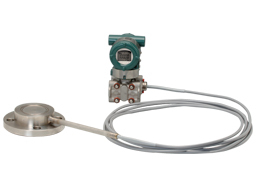 In-Line Mount Absolute Pressure Transmitter based on the EJA-E Series. Absolute Pressure Diaphragm Seal System consists of absolute pressure transmitter with single diaphragm seal. Refer to the General Specification sheet located under the 'Downloads' tab for detailed specifications.